When I was a baby my Dad was sold two plots of land in the New Mexico desert outside of Albuquerque. I have heard about this land my whole life. This trip taking us through New Mexico provided the perfect opportunity to see what I might inherit one day. A few weeks ago, armed with Dad's parcel ID numbers, I called Valencia County to get street addresses for Dad's places. That's when I learned there are no addresses. It turns out the land was never developed, it was a huge scam. But we still thought it would be fun to find the property. And after all, we have a Jeep with us and it can go in four-wheel-drive, so even if this is raw land in the middle of the desert, shouldn't we be able to locate it? 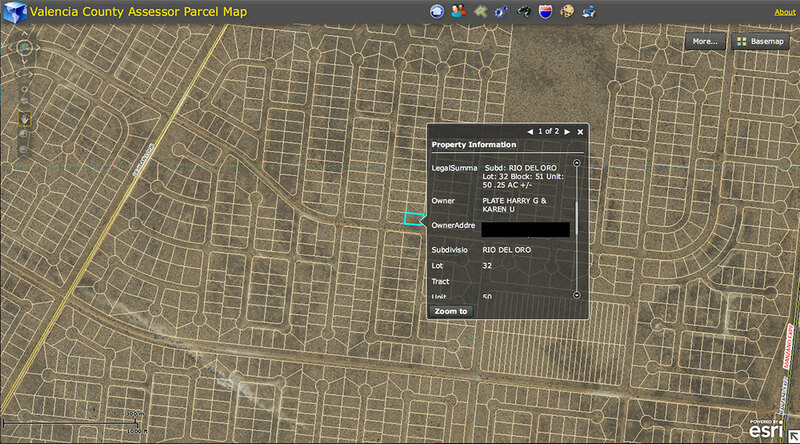 Using the Valencia County assessor's website I located the properties and chose the one that seemed to be more accessible. Then I used Google Maps to find the spot and get its GPS location. Armed with technology, we set out to find my Dad's land (Dad, if you are reading this in Mail, visit this page in your web browser so you can watch the movie). Click the image below to see a 360º panorama of the spot.